Copies of Islamic State's English-language propaganda magazine, Dabiq, have been pulled from the website of online retailer Amazon. Four different volumes were available for sale on the site, but in a statement to the BBC, Amazon said the product had now been removed. The author of the publications was listed as al-Hayat Media Centre, which is IS's Western-focused media arm. Islamic State is a proscribed terrorist organisation in the UK. The magazines were being sold in paperback form on Amazon sites in the UK, US, France, Germany, Italy and Spain. It can be downloaded for free elsewhere. Amazon's statement to the BBC read: "This product is no longer available for sale." The company did not give any further details. 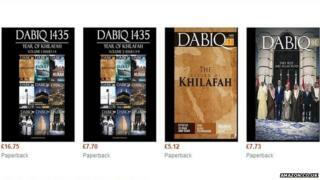 Dabiq is described on Amazon as "a periodical magazine focusing on issues of tawhid (unity), manhaj (truth-seeking), hijrah (migration), jihad (holy war), and jama'ah (community)". The publication, named after the small Syrian town of Dabiq for symbolic reasons, was launched in 2014. Amazon's websites list the publisher of the magazines as "CreateSpace Independent Publishing Platform", which is an Amazon-owned self-publishing company.